Happy Friday everyone! 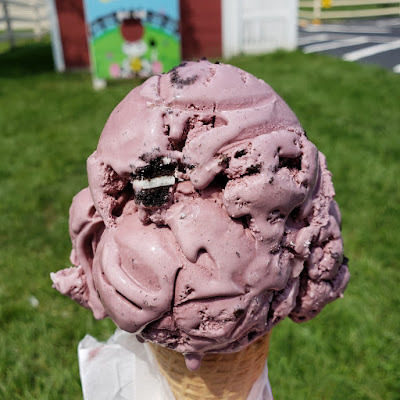 Question: have you ever had Black Raspberry Oreo ice cream? I started thinking about it and realized that I'm not sure I have. That seems silly considering how much I enjoy both Black Raspberry and Oreo ice creams. Why have I not tried this sooner? Wait, maybe I should have started off the fact that I made it back to Uhlman's!! Long, long, long time readers will know that I came up with the idea for this blog not to far from their scoop shop. To put it another way, it's been a decade since I posted a review about this place. It was a conversation about grapenut ice cream that got me here in the first place, and for the record, grapenut ice cream is surprisingly tasty. Is Uhlman's still good? Ofcourse! It's a sweet black raspberry base with big chunks of Oreo cookies. It's been too long to say if the ice cream is identical to how it was before, but it was still very enjoyable. I do want to call it Black Raspberry Cookies & Cream, but the reality is that this is more about Oreo chunks than it is about any kind of wafer crumbs invading the base. I'm probably splitting hairs here but you should know that I'm a huge C&C fan and the best C&C flavors have wafer crumbs throughout. So that's why I think it's ok they call it Black Raspberry Oreo and not C&C. I know it's August but I will try to get back here a few more times before it turns colder. It's a nice place to hang out, especially when it gets quieter (later in the season). Can I nitpick one thing though? When setting your prices, please don't set it so that it comes out to a weird number after tax. This cone was $3.75, but with tax, it comes out to $4.01. That's right, 1 penny over and ofcourse I had no change in my pocket. I know for next time, but I thought that was pretty dumb. My server shouldn't have had to break out 99 cents in change. (I feel like someone is talking to this review right now and going "maybe they are trying to encourage tipping?"). Dubba, thanks for reviewing a place I never heard of--Uhlman's. Too bad they are only in Massachusetts because they have some incredible flavors. Their S'mores looks enticing, and I hope for the fall, you can do a review on their Pumpkin Oreo combo. I never heard of that one before. I should plan field trip. Black Raspberry Oreo Ice Cream is delicious. Rockwell Creamery, a fantastic ice cream parlor in Provo, Utah, sometimes has black raspberry Oreo as a special. It is phenomenal. @Anon#1: yeah, I try not to get too local, but I will make exception for flavors that are both enticing and hopefully available somewhere in your general area. I will make a note to try the Pumpkin one!